This advertisement ran in Cleveland Town Topics and is representative of the hundreds of advertisements Deming placed in that publication. 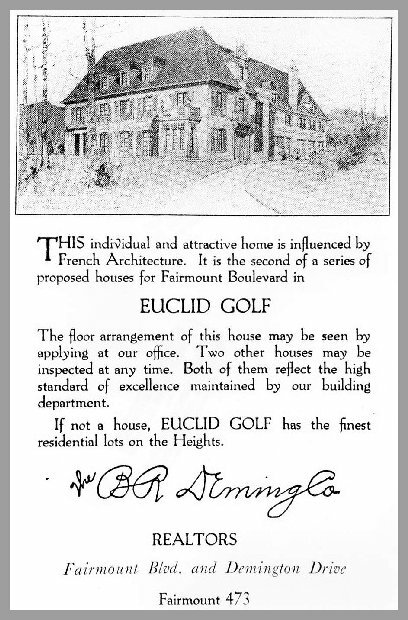 This particular advertisement features a drawing of a house that was available to be built by a prospective Euclid Golf resident. The plate on the drawing reads: "Proposed Residence for Euclid Golf Allotment." The original pencil on paper drawing used for this advertisement still exists, and has the inscription "Return to B.R. Deming" written on the back. We speculate that this is a Howell & Thomas design. While not actually built, its massing and fenestration is similar to the A.C. Ernst house at Fairmount Blvd. and Ardleigh Dr., and we suspect that this was a chateauesque version of the English house actually built at that location, on speculation, by Deming. Image courtesy of Western Reserve Historical Society. Permission pending.